Did you know that Aardman Animations are celebrating a special birthday this year? Turning 40 in the late summer, Aardman is marking the occasion with a series of special events, exhibitions and merchandise to mark the occasion! The celebrations kick off with a special countdown on Aardman.com, where for the next 40 days you’ll be able to watch classic clips, behind the scenes videos, interactive experiences and more from across the whole Aardman back catalogue of film, TV, digital and advertising. You’ll also be able to get your hands on some very special products that are set to launch between now and the end of the year, including a commemorative Isle of Man Post Office stamp collection and gift products, beautifully crafted Steiff toys of some of Aardman’s best-loved characters and The Art of Aardman Book, a stunning collection of rarely seen drawings, storyboards and stills from Aardman films, shows and adverts. Later in September, animation and art enthusiasts will also have the chance to own their very own original piece of Aardman art that is being exhibited and sold at The Illustration Cupboard gallery in London. 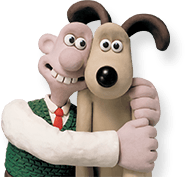 An exciting array of original artwork from Aardman artists will be on show, including drawings and character studies of Wallace & Gromit by Nick Park and the inimitable Morph by Peter Lord. There will also be a specially produced sculpture of Morph on display and many other pieces! You can keep up with the 40th Countdown on the Aardman website, plus follow Aardman on Twitter and Facebook for news on events and competitions!